Perth water bore pumps and motors are commonly of two types in residential garden bores. There are variations to the above such as very old belt-driven pumps still seen in market gardens and very old wells, and jet pumps that were employed in low-yield bores. Both belt-driven pumps and jet pumps and other variants are now quite uncommon so this article is limited to submersible bore pumps and centrifugal bore pumps that are seen more frequently in Perth bores. Submersible pumps in modern Perth garden water bores are contained beneath the ground normally about 6 metres below the watertable. They are mostly stainless steel, cylindrical, shaped like a torpedo and normally in residential garden bores they are of nominal 4 inch diameter fitting inside a 100mm bore casing. Seen here to the left are Lowara 4″ submersible bore motors coupled to Lowara submersible pumps. The pump is often referred to as the “wet-end” whilst the combined motor/pump unit is often just called the bore pump. Other common bore pump and motor brands are Davey, Onga, Sumoto, Centripro, Calpeda, Arwana, Franklin, Red Jacket, Grundfos, Signature, Marlow, Universal and Pioneer. Our experienced bore service teams replace and repair bores that use all of these brands and many more. 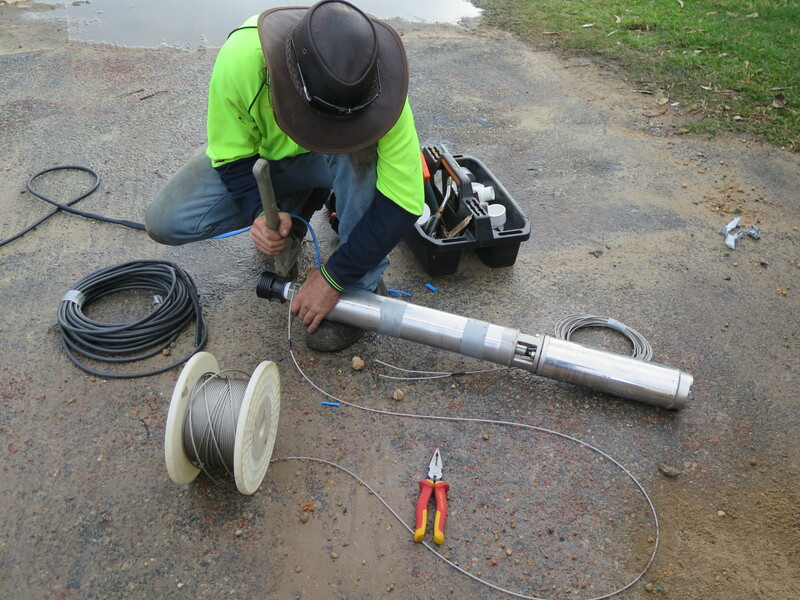 More details of Perth submersible bore construction can be found on our “water bores page”. 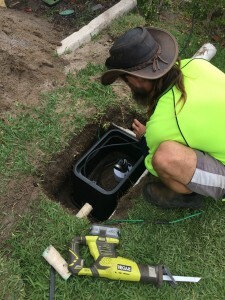 Submersible bore pumps in Perth garden bores are normally either 1.1kw (1.5hp) or 1.5kw (hp) depending on the depth to water and the area being irrigated. They can be either 3 phase or single phase. A submersible pump is a device which has a hermetically sealed motor close-coupled to the pump body. The whole assembly is submerged in the fluid to be pumped. The main advantage of this type of pump is that it prevents pump cavitation, a problem associated with a high elevation difference between pump and the fluid surface. Submersible pumps push fluid to the surface as opposed those pumps that pull fluids.The picture to the right are of Sumoto submersible motors of various kW. Generically and collectively the whole assembly is referred to as a pump. In fact it is two entirely separate parts bolted together. In the industry the top part is referred to as the “wet-end” (sometimes as the “pump”) and the bottom section the “motor”. These two sections are generally interchangeable and compatible from brand to brand providing the kilowatt rating is the same. Many other sizes exist ranging from .25kw up to more than 7.5kw. In areas where water bores are very deep such as near the water tower in City Beach or the highest parts of Melville pumps may commonly be 2.2kw (hp) or more. Submersible pumps are very reliable and normally require very little service or maintenance. When service is required however it is best to call a specialist bore pump service man or specialist bore pump electrician. Our bore service teams cover all of the extended Perth metro area. The submersible pump motor itself can be susceptible to lightning induction (which may be covered under insurance) or occasionally fusion. Pump motor fusion (sometimes referred to as burnt out or fused motor) is often covered by household insurance policies so it is important an experienced pump electrician tests this.Give us a call if you have an insurance enquiry that may relate to bore pump fusion, fused pumps or bore lightning damage. Sometimes the problem is relatively minor and can be traced to a blown start/run capacitor in single phase motors. Typically these are contained in the single phase start box. To the left is pictured a Lowara single phase start box. Our Perth pump repair and service team have vast local knowledge and experience and have handled 1000’s of bore pump motor replacements. Please call us on 1300 734 300 with any Perth bore pump repair query. Perth Pump/Motor Fusion and insurance cover: Many household insurance policies covering Perth homes have fusion cover for electric motors. Virgin Bores are Perth’s experts in water bore electrical service and repairs. Our knowledge and experience will save you time and money. A common insurance definition for FUSION is “The actual burning out of an electric motor or its wiring caused by the electric current in it.” In the case of either centrifugal bore pumps or submersible bore pumps this refers to the electric motor that drives them. Various terms are used to describe the event of fusion. Some will refer to the pump motor as “burnt out” or “fused”. Some insurance policies refer to power surges. Additional insurance cover may be provided for lightning or storm damage to bore pump motors. Your bore pump motor replacement may be covered under you insurance. Virgin Bores have over a decade’s experience replacing fused pump motors in Perth and surrounds. Perth bore pumps and irrigation-reticulation systems are our specialty. Call us on 1300 734 300. Perth metro-wide. Centrifugal pumps in Perth wells are most commonly 2.2kw (hp), but there are many other sizes in both 3 phase and singe phase. Size depends on the distance pumped, the head, and the size of the area to be irrigated. If you lift the conical tin lid on most Perth well-style bores and look down you will see something that looks like a pool pump. This is most often a centrifugal pump. Common bore pump brands include Davey, Stalker, Lowara, Onga, Boremaster,and Grundfos. Generally wells were dug to a depth that enabled the pump to be within around 4 metres of the water table (static water level). Beyond this range and centrifugal pumps struggle with lift and prime. Beneath the pump is a further spear or casing that goes into the ground commonly for another 6 to 15 metres. In areas of Perth where the water table is shallow, such as lots of Ballajura, Willeton, Bull Creek and most of Morley, the centrifugal pump may even be on the surface or only one or two well-liners ( 2 or 3 metres) down. In areas such as Hamilton Hill or Karrinyup some old style wells may be 30 metres down to the pump at the bottom of a long ladder. Beneath that is a spear or casing that may extend another 10 to 15 metres. Centrifugal Pumps are used for large discharge through smaller heads. Liquid entering the pump receives kinetic energy from the rotating impeller. The centrifugal action of the impeller accelerates the liquid to a high velocity, transferring mechanical (rotational) energy to the liquid. A centrifugal pump containing two or more impellers is called a multistage centrifugal pump. Centrifugal pump problems can include cavitation, impeller wear, corrosion, overheating due to low flow, leakage along rotating shaft and lack of prime amongst others. The electric motor driving the pump, like any motor can be subject to fusion. A very common call to our Perth bore service hotline (1300 734 300) would be “I can hear my pump running but no water is coming out!” and the accompanying “I think my bore has run out of water”. This is a very common call when the water bore centrifugal pump has not been run for a while such as at the start of summer. Most often this would be a priming problem.There is a slow leak somewhere, often in the check valve beneath the pump that has caused the pump to lose prime. Other causes could be a leak around the shaft joining the pump to the motor, leaking gland–packing or a leak in the suction pipe descending to the water table. Sometimes it is a problem with the pumps mechanical seal. Rarely (although possible) is it due to a drop in the water table. A drop in the water level, although not common, would typically present itself at the end of summer and even more so after several consecutive summers. Occasionally the screens are blocked. Sometimes it may be a problem with the suction pipe. 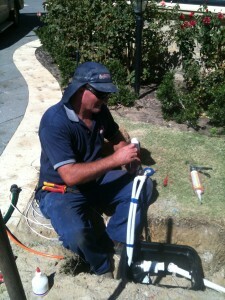 It may even not be a problem with the water bore or pump but indeed a problem with the reticulation sprinkler system. Perhaps solenoid valves are not opening thereby preventing delivery of the bore water. 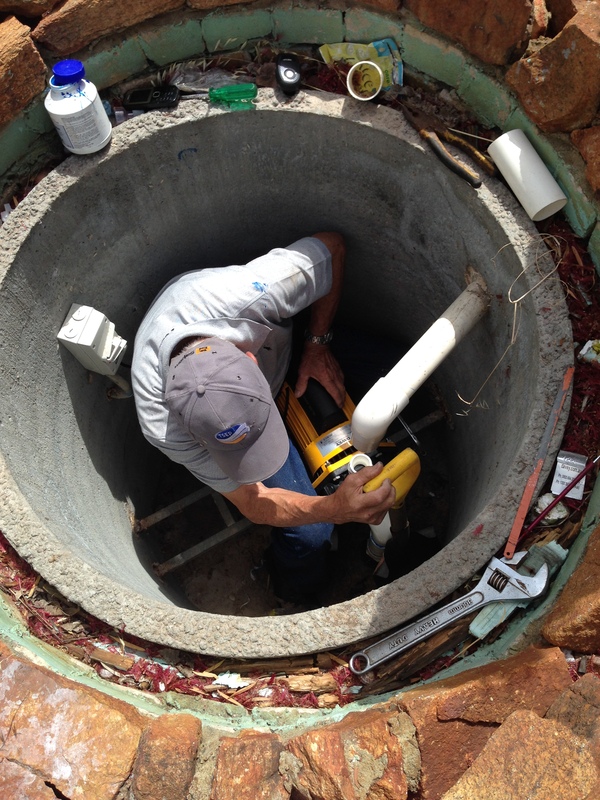 Our Perth bore pump service team has vast experience and unsurpassed local knowledge in solving all bore problems. More information is on our “service & repairs” page or call 9246 0111 to book a service. Electrical problem: Another common call with older centrifugal pumps in bores or wells is along the lines of “my pump won’t start at all”, “when I try and start my pump the circuit-breaker trips in my meter box” or “when I start the pump the fuse blows”. Mostly callers leap to the first conclusion that the pump motor is fused. This indeed can be the case but there are a host of other reasons that may present the same symptoms. These include a blown bore start capacitor, a faulty 3 phase DOL (Direct Online Starter- the typically red/green or red/black over-ride buttons) a faulty electrical connection, moisture in a junction somewhere or a faulty isolation switch in the well. It could even be a faulty reticulation controller or 24 pump start relay. In any event, our first recommendation would be we send our specialist bore pump electricians to test everything. If indeed the motor is fused we can certify it as such and will quote on a replacement. Pump motor fusion (sometimes referred to as a burnt out motor) is often covered by household insurance policies so it is important an experienced pump electrician tests this. Bore electrical services are our specialty. More information on repairing Perth pumps and motors in bores and wells can be found on our “service & repair” page. To book a bore service or repair for Perth and suburbs please call us anytime on 9246 0111 .